Keep your hands toasty whilst we’re being hit by these freezing temperatures. 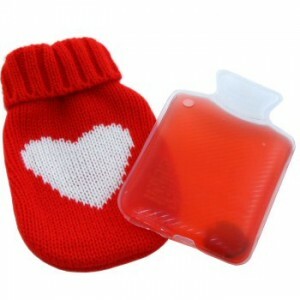 These cute mini hot water bottle styled hand warmers are the perfect thing for the job. Simply remove the pack from it’s cosy knitted cover and press on the little internal disc inside to activate the chemical reaction and produce heat. It’s reusable too. Simply drop the pack into some boiling water for around 15 minutes and it’s done! The mini hottie hand warmers come in three different designs to choose from and are most efficient at keeping your hands warm when you have two of them – one for each hand/pocket.